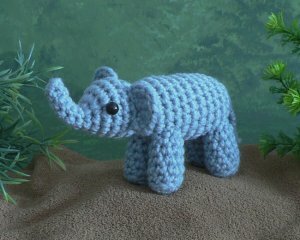 An original crochet amigurumi Elephant pattern from the AfricAmi range by June Gilbank. Note: Take advantage of the savings when you buy this pattern as part of AfricAmi Set 1! Yes, this is the elephant from my Discworld Project! Date Added: 05/21/2017 by Alicia B. Date Added: 01/20/2016 by Margo W.
Date Added: 01/03/2016 by Jaclyn M.
Date Added: 07/31/2014 by Linda S.
Date Added: 11/08/2013 by Sheryl W.
Date Added: 06/13/2011 by Helen C.
Date Added: 11/21/2010 by Heather H.
Date Added: 09/10/2010 by Joy B.